It was 1914, exactly 100 years ago, on Christmas Day, that something miraculous happened. It was World War I, the defending Allies were engaged in a bitter combat against the invading German troop at the Belgium-France border. But on December 24th, at points along the western front, Germans placed lighted trees on trench and the Allies joined them in an impromptu peace. The German shouted to the British: "Merry Christmas". 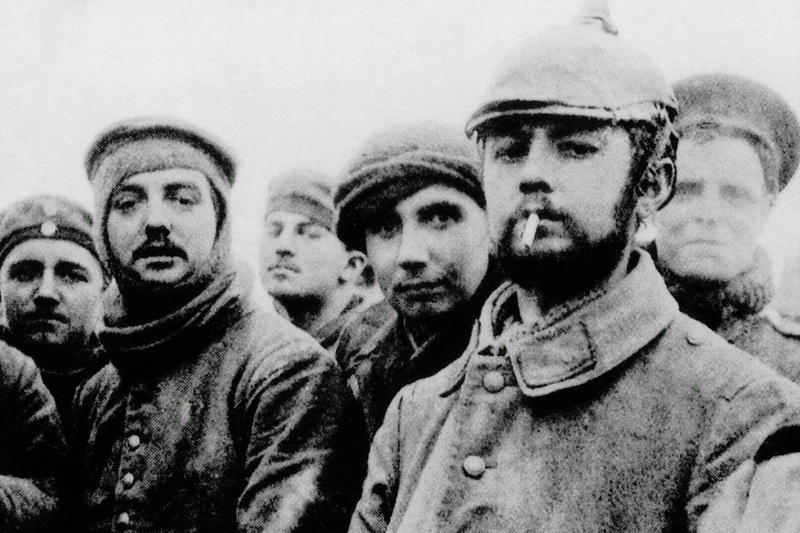 Eventually, the British, Belgian and French soldiers crawled out of the trenches, and after shouts of promises to hold their fire, they approached the men whom they’d been trying to kill just hours earlier and were already waiting in the middle of no man's land. The men shook hands and exchanged gifts such as liquor, badges and buttons, tobacco and sausage, all the while showing each other pictures of their families. Many agreed to extend the peace into Christmas Day, so they could meet again and bury their dead. Each side helped the other dig graves and hold memorials; at one, a Scottish chaplain led a bilingual recitation of the 23rd Psalm. Everyone was in good spirit, and then they decided to use their helmets as goalposts and played a game of football. "Everywhere you looked, the occupants of the trenches stood about talking to each other and even playing football," said Hugo Klemm of the 133rd Saxon Regiment. "It was hard to think we were at war with one another," wrote a soldier quoted in Weintraub's book. The soldiers wanted to stop the war, but officers on both sides were adamant to continue their missions. The truce was impromptu, and the top brass were unhappy about it. It was the first and the last of its kind because it never happened again since, largely due to the threat of court-martial. Most war historians agree that the event really did happen--although fighting did continue in some places--except for one thing: the football match. Nonetheless, the story of the Christmas Truce showed that given a choice, nobody wants to go out there killing people, and that the celebration of the birth of the Prince of Peace could halt, albeit just for a while, one of the bloodiest wars in all of human history. And to quote a sentence by one of the soldiers in his letter to his mother: "Dearest mother, I have seen one of the most extraordinary sights"
p/s: Watch the documentary of the Christmas Truce here and here. p/s2: I've found a marvellous advertisement by Sainsbury reenacting the Christmas Truce of 1914.